It has been 10 years now since I started doing stonework on my own here in Canada. As much as I enjoyed doing the hard work it seems that my body did not. Recently I have been diagnosed with an injury caused by all that heavy lifting and repetitive motions. Due to this I am sad to announce that I would not be able to do any stonework in the near future and possibly not ever again. At this point I will refocus all my efforts to expand the woodworking side of my business and continue to do the custom cabinetry and smaller carpentry projects that pique my interest. 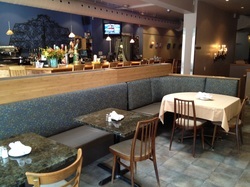 New banquette seating and cabinetry at Vesuvio Pizzeria. Our under stair storage has just been featured in the following Houzz article. 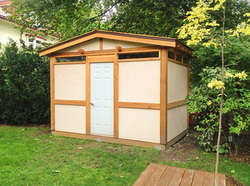 This shed was built to clients specifications in the summer of 2009. It was designed to achieve the desired look while minimizing the cost by choice of building materials. The sliding door allows for easy access in the narrow space. 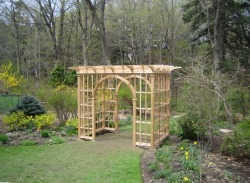 Latest addition to our gallery is this wonderful cedar pergola. 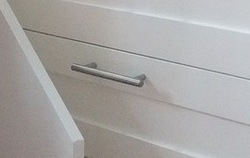 It was built from plans provided by the client and done in such a way as to hide and fasteners that were used.